While heads in Europe are firmly turned to face the ongoing tragedy of migrant deaths in the Mediterranean, another equally dangerous migration path is being carved out in Asia. On Monday around 1000 asylum seekers came ashore on the Malaysian resort island Langkawi, mostly Rohingya people fleeing religious persecution. The Rohingya are an indigenous, currently stateless Muslim minority who inhabit the region crossing the border between Myanmar and Bangladesh. Four boats were rescued after three of them were abandoned by smugglers. Hotels quickly organised food and water for the asylum seekers – but this arrival is far from an anomaly. The International Organisation for Migration (IOM) was hurrying to reach the people and provide support. The UNHCR estimates that 25,000 people have fled the two countries by boat this year – twice the 2014 figure. The Rohingya are persecuted thanks to a powerful anti-Muslim sentiment in the region, and have been subjected to attacks by Buddhist mobs. The Rohingya, who number 1 million in Myanmar alone, are rejected by the government there, which refers to them as Bengali – implying that they belong in Bangladesh. But Bangladesh refuses to recognise them as well. Attacks on Rohingya in 2012 and 2013 forced 100,000 into refugee camps. Much like asylum seekers in Northern Africa, Rohingya are paying people smugglers to transport them to Malaysia. But since the most recent arrivals, Malaysian officials have gone against the UN’s plea for countries to keep their borders open to those seeking protection, saying they will no longer accept boats unless they are no longer seaworthy and are sinking. This kind of policy is exactly what puts these migrants in danger as it encourages smugglers to abandon the boats and leave them to sink with helpless people on board. 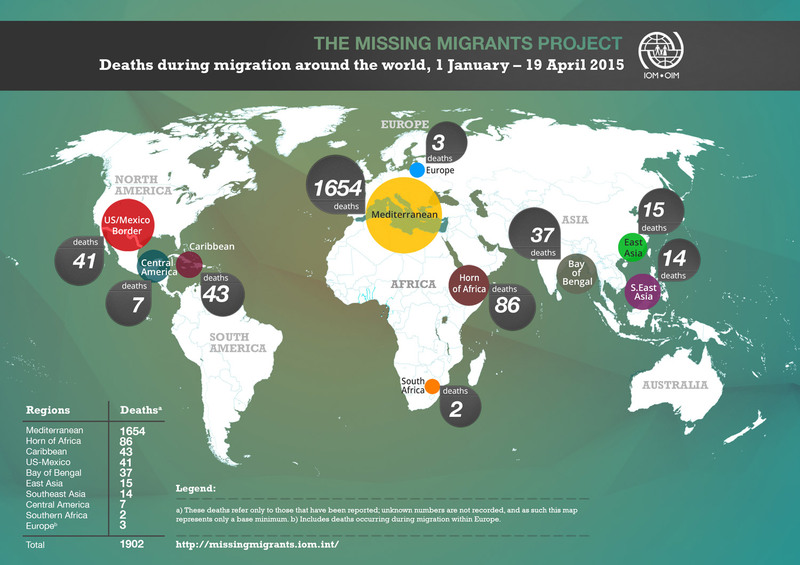 As the map above from the IOM illustrates, deadly migrant journeys continue to be paved all around the world. Pussyfooting around regional issues isn’t going to save these lives – lives which must be saved, not counted. This crisis demands a global response.